Charlotte, NC (December 9, 2015): David Weekley Homes, the nation’s largest privately-held builder, has begun construction on a new home off the highly sought-after street of Ideal Way. 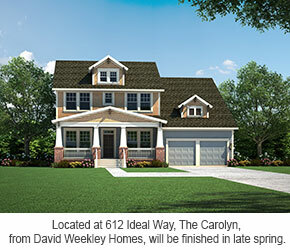 Located at 612 Ideal Way, David Weekley is building The Carolyn, which was the model home in the builder’s Bailey Springs at Davidson community, and is currently offered in Hawthorne in Harrisburg and The Estates of Massey in Fort Mill, SC. At nearly 3,000 square feet, the two-story Carolyn at 612 Ideal Way offers four bedrooms, three full baths, one half bath and a two-car, front-load garage. The home features Weekley’s signature oversized kitchen island, overlooking the breakfast area, sunroom and the family room with fireplace. The craftsman-style exterior highlights the home’s spacious front porch, along with tapered columns, brick and shake accents on siding, porch railing and dormer. The Carolyn’s high-end finishes and fixtures include French doors at the study, an open formal dining room, a main-floor owner’s retreat with bay window and walk-through access to the utility room, a super shower in the owner’s bath, a large covered rear porch and a media room. All of David Weekley’s homes in Charlotte feature the latest in energy-efficient building techniques and are built to the Environments For Living® Gold Level Program standards. Weekley’s homes in Charlotte are on average 35 percent more energy-efficient than a home built in 2006 and come with a heating and cooling energy usage guarantee, and a three-year comfort guarantee, backed by Environments For Living. The Carolyn is located near two David Weekley Homes communities currently under construction, Central Living at Ideal Way and Central Living at Iverson. The communities and The Carolyn offer a unique opportunity to own a single-family home in an area dominated by apartments, and include such in-town amenities as walking distance to LYNX Light Rail and Sedgefield Park, proximity to shopping, dining and entertainment on South Boulevard, and easy access to area sports venues, Carolinas Medical Center and Uptown Charlotte. Priced at $762,259, The Carolyn will be finished in late spring. For more information about The Carolyn, contact 800-393-9968.